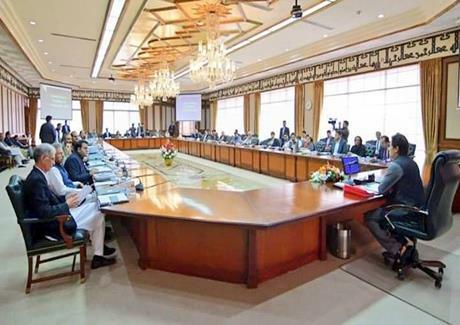 Federal Cabinet today reviewed the progress made in 100-day plan of the government and decided to bring the progress before public later this week. Minister for Information and Broadcasting Chaudhary Fawad Hussain while briefing media in Islamabad this evening on cabinet decisions said the meeting deliberated on the targets set by the government in various areas. He said the cabinet also discussed Prime Minister's visit to China in which emphasis will be placed on further strengthen ties with our all-weather friend besides focusing on transfer of technology to Pakistan. Information Minister said a meeting of Privatization Board was held yesterday which decided that privatization process of Pakistan International Airlines and Pakistan Steel Mills will be stopped forthwith and these organizations will be restructured. He said the meeting decided to privatize SME Bank, First Women Bank Ltd., Balloki Power Plant, Haveli Bahadur Shah plant, Jinnah Convention Center, Lakhra Cola Mine, Services International Hotel Lahore, and Marri Petrluem Ltd. Chaudhary Fawad Hussain said a committee comprising ministers of interior, information, human rights, and other government members held meetings with Chairman Pakistan Peoples Party Bilawal Bhutto and President PML-N Shahbaz Sharif. They were fully briefed on the situation arising out of sit-in by some religious elements. They were also informed of the steps taken by the government to tackle the situation including the address of Prime Minister to the nation. He said opposition has assured their full cooperation in this regard. Speaking on the occasion, Minister for Planning and Development Makhdoom Khusro Bakhtyar said Pak-China relations span over decades and China is a dependable partner of Pakistan. He said Prime Minister's visit is focused on Pakistan's needs and priorities. He said during his visit to China Imran Khan will meet president Xi Jinping which will be his first meeting with Chinese leadership after taking oath. He will also hold talks with Chinese premier. The Prime Minister will meet with Chinese businessmen and heads of leading corporations. He will attend Shanghai Expo as Guest of Honor which will provide an opportunity to meet with leading businessmen as well as other heads of government and meeting attending the event. Khushro Bakhtyar said priorities and future direction of CPEC will also be discussed during meetings with Chinese officials. He said the government has decided to increase and widen the scope of CPEC in order to reap maximum benefits from this mega project. He said it has been decided to establish a new joint working group on socio economic development. He said in agriculture, livestock, value added chain and other areas are being explored for joint collaboration. The Planning Minister said Chinese economy is worth 12.50 trillion dollars. They import products of 1800 billion dollars from the world. If Pakistan succeeds in getting the share of one percent import of China, this will be a huge plus for Pakistan. The Minister said our priorities also include poverty reduction and poverty alleviation and talks will be held in this area too. China has vast experience in poverty reduction policies and it has lifted millions of people from the trap of poverty. Khusro Bakhtyar said the potential of Gwadar will be fully harnessed in order to serve it as a gateway for marine trade as well as getting all benefits of blue economy.